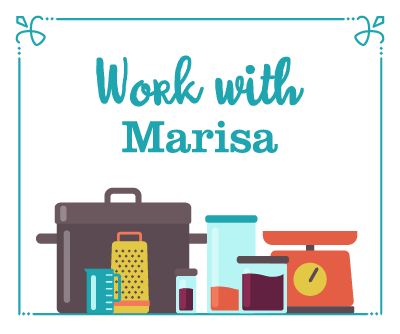 Food in Jars contributor Alex Jones is back again, this time with a post about her goal to get a better handle on her freezer situation for 2017. It has inspired me to do an inventory of my own freezer compartment and I’m with her in resolving to be better about keeping that space in check! I don’t usually make resolutions, but 2017 so far has definitely been about refining some parts of my life that overwhelmed me in 2016. For me, that’s looked like refocusing my freelance work, getting a better handle on healthy eating habits, setting financial and life goals with my partner, engaging in political activism, and taking time for regular self-care. Another has been a newfound focus on maintaining my living space, the two-bedroom apartment in West Philly that my man and I have lived in for almost six years now. We’re both the kind of people who can spend days (or weeks) stepping over and working around clutter and messes when other responsibilities take precedence. But more and more, we realize what a positive effect a clean, organized, and uncluttered space has on mood and productivity in our home. So far I’ve swept the clutter from my desk, deep-cleaned the bathroom, and KonMari-ed my clothes. 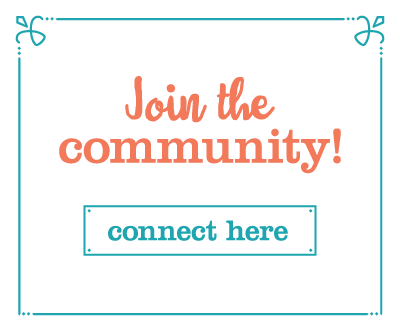 Now, I’m focusing on the kitchen, and I’ll be sharing some of my cleaning and organizing projects with you over my next few posts. First, I wanted to reckon with my freezers. I have a 5.3-cubic foot chest freezer in one corner of the big front room that serves as our living room, dining room, and kitchen, plus the freezer compartment of my fridge. Over time, the contents had become the ice-crusted and mysterious, with plastic tubs of last year’s leftover soup jumbled with big bags of flour and tiny bags of roasted jalapeños. Finding ingredients I’d frozen months before while a hot pan was waiting on the stove had become more and more of a hassle. It was time to excavate and take stock. If you’re particularly worried about the effects of a brief thaw on your food or have a hoard of delicate freezables like ice cream, you can prepare some coolers with ice packs in which to stash your items before you empty the freezer. I planned to work quickly, so I simply cleared the counter and the dining table and used those as my staging surfaces. I sorted items by type as I pulled them out of the deep freeze. There weren’t too many surprises, but the biggest shock was seeing all that food set out in one place. The three gallons of sour cherries I’d picked from neighborhood trees and then stemmed and pitted. The fresh-milled flour I purchased with the intent of starting up a weekly bread baking habit. The leek tops I always tuck away to add to my next stock pot. The expensive foraged mushrooms I’d dried to flavor a future batch of risotto. And so, so many tomatoes—frozen whole, roasted into wrinkles, peeled, stewed, sauced. Once the chest freezer was empty, I chipped away at the ice buildup around the lid with a metal spoon and used a turner to scoop up the frost (and a few stray blueberries) at the bottom. Then I stacked my gallon ziptops of precious local fruit one on top of the other by type, so that I wouldn’t wonder what lurked underneath without digging to the bottom, along with my big ten-pound bags of flour. Smaller bags of grains went on top of those, then bags of ginger, leeks, and parsley. I bagged up my cold packs to keep them together. I made the choice to cut my losses and compost some especially unappetizing items, like stale baguette ends (for the breadcrumbs I’d never make) and batches of green soup (which I love fresh but just turns into runny green mud after freezing and thawing). Next, I turned to the small freezer. Since it opens from the front, landslides of oddly-shaped items are a common occurrence. Despite its smaller size, so many bags of food covered my dining room table. 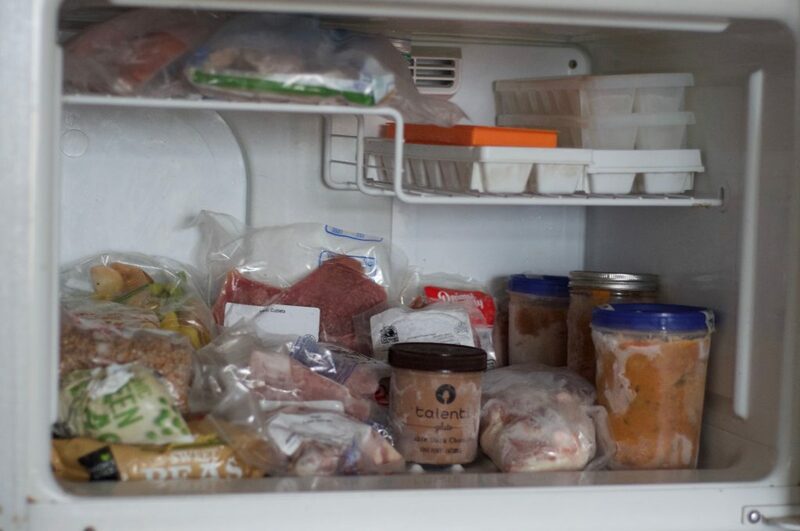 (I pulled out everything but the gelato and the frozen fish fillets since I was worried about those thawing). Once again, I sorted by type and had to let go of some dreams. I was never going to turn these two-year-old green gooseberries into something palatable, nor cook the fenugreek leaves I bought for curry shortly after moving into this apartment in…2012. After wiping out several years’ worth of crud, discarding some of those sad, old items and grouping others (like the bags of aged celery hearts and bunches of parsley I save for stock) in the chest freezer with similar items, I restocked the small freezer. 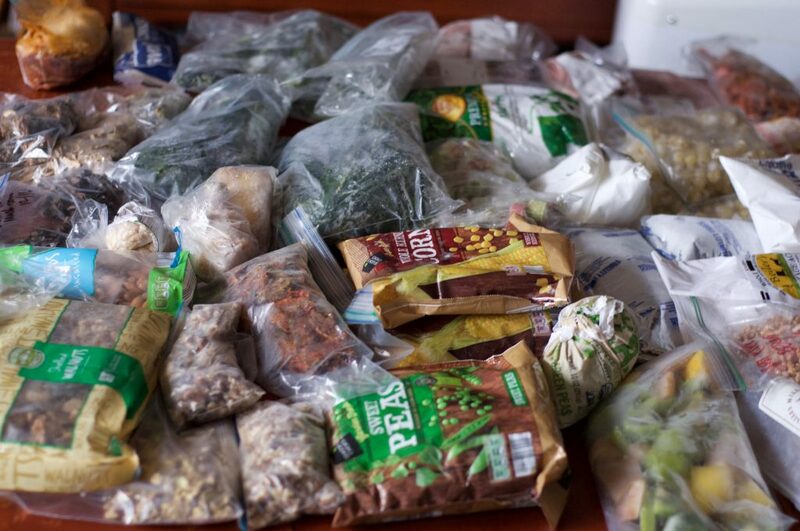 I decided to keep ready-to-eat foods like recent leftovers, veggies, packages of meat, and small bags of items like nuts, dried mushrooms, and peppers there. I deliberately restocked this freezer so that there would be lots of extra room and easy-to-cook items in heavier rotation would be easy to find. (This is especially a plus with a colorblind partner who sometimes has trouble keeping up with my typically overstocked fridge full of unlabeled items). As soon as everything was back in its frosty place, I felt much better about my year ahead. Not just because I’d crossed a long-nagging item off my to-do list, but because having a better handle on these ingredients makes me feel more confident about my ability to put some of my 2017 intentions into action. Now that I know what’s in the freezer, I know what I should be using a little (or a lot) of each week until midsummer comes around, when I’ll start the cycle over again—a little more organized this time. How do you guys handle your freezers? Are you good about keeping an inventory? And what’s your approach when it’s time to do a big clean-out like this one? 1) keep an inventory posted on the side of the upstairs fridge/freezer, with what is in the downstairs freezer and when it was put there. 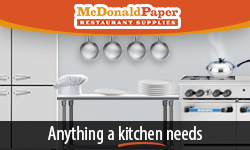 Broken down by categories, like “uncooked foods”, “cooked meals”, “desserts”, “fruit”, etc. Meanwhile, the freezer attached to my kitchen fridge is kind of random and a mess :-). 2) plan defrosts for the winter, when I can pack everything in coolers on the porch for a day (or two, if need be) while I defrost. Doesn’t always work out that way, but it’s a help. The easiest way to clean the freezer is to move! I just did. As I unpacked a counter top small freezer into ice chests I tossed freezer burnt items and old breads, etc. Defrosted, 1st time in 8 years, surprising little ice. Put stuff back as mover said he’d move it filled. Sure was a a kick in the rear to do a long over due job. Wow! Moving an empty chest freezer isn’t so bad, but moving one full sounds like quite an effort. What a nice mover! I also have a large upright manual defrost freezer which I have on an unheated enclosed side porch. I try to defrost it twice a year. Forgot to defrost it in the fall and now have a build up of frost/ice. I have plastic totes about 2′ wide and about 3″ shorter than the depth of the freezer shelves. I have separate totes for beef, chicken, pork, vegetables, fruits & nuts. This makes it somewhat easier to organize and defrost. When I defrost, I bring in some coolers from my shed to hold loose items from the freezer door and other items not in the totes. The items in the totes I cover with tarps after going through each one and discarding freezer burned or unusable items. The whole process takes at least a whole day. It’s something I dread doing as I end up with frozen fingers! Now if I could only teach everyone to be sure the freezer door is shut (!!!! )after removing something, I might only have to do this once a year! I made a spreadsheet of everything I have in my kitchen freezer + my small chest freezer in the garage. The garage is downstairs, so now all I have to do is refer to my printed out sheet that I keep on the freezer door. I cross off items as I use them…. it really helps me to have a visual index and saves me from either buying stuff I already have at the farmer’s market, or impulse grocery shopping. Thanks for sharing the spreadsheet freezer list concept. As with you, this will be a great way for me to visualize, plan and use the items I already have on hand. 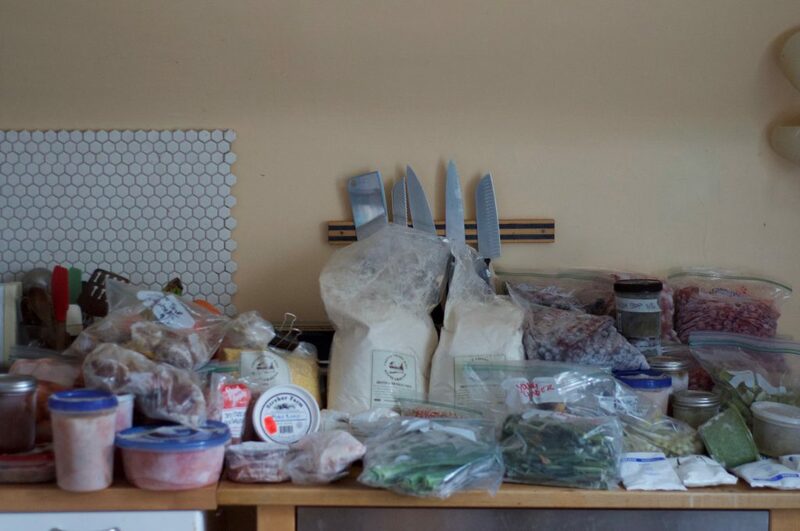 I started my blog to chronicle working through all the stored up food in my parents’ house. That took over six months, even with throwing out the worst of it. Now I try to work through items within three or four months, although I admit to having more jars of homemade mustards and jams than usual this time of year. 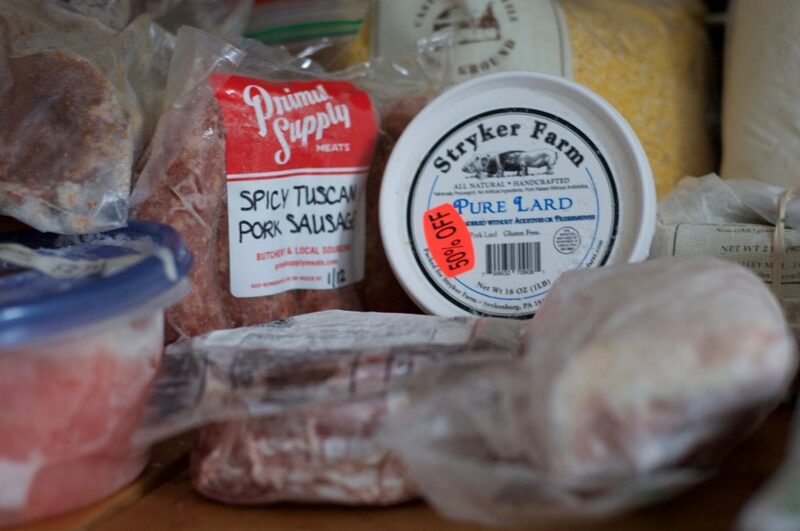 The chest freezer is almost exclusively for meats bought at a good price and baked goods (or cookie dough). It’s getting kind of iceberg-ey in there, so I guess I’ll have to work it down enough to get everything in the kitchen freezer for a couple of days. I have an upright,manual defrost freezer in my basement. The idea was, like Laurie, to stock it with premade meals I would bulk prepare. To some degree, I’ve been doing that, but slowly the freezer has filled up with a zillion heels of bread, bags of vegetable ends and bones for stock, too many bags of flour from my KAF addiction, and the nasty bits from a lamb that a friend of a friend butchered. (We ate most of the meat but don’t know what to do with the nasty bits.) My fridge freezer is in much worse shape. I’ll have to draw some inspiration from this post and clean it out and do an inventory. I just used my lamb offal in a haggis for Robbie Burns Day last month. Making it a big deal helped make the daunting task easier to handle. It was a lot of fun, and tasted pretty good too! This is really inspiring. I have been eyeing my freezers and pantry cupboards apprehensively for a few days now. Time to tackle it! I’m glad I’m not the only one. My upright frost-free freezer is in the basement. I have a bad habit of stocking it and then not depleting the contents. Hence, if something is buried in there, I tend to forgetaboutit…. Fortunately, or, unfortunately, depending on how you look at it, because the cellar is cold and the freezer has a design thaw, the drain tube tends to get clogged with ice, and when I see a pool of ice at the floor of the unit, it is time to empty it out to thaw the ice dam. This forces me to clean and sort, and put those older inhabitants to the fore. BUT–the upstairs refrigerator freezer can still be a dark mystery, and like others, is filled with dibs of this and dabs of that, sometimes not discovered until years later. I keep wanting to make an inventory list, but I keep putting it off. Guess I had better get cracking at it…! I sooo laughed at your green soup reference. I once pureed a spinach soup and the kids started calling it “Cream of Pond Scum”! Got tossed even though it still tasted good–some things you can’t get past! You are so right to just toss some things (though I do still feel guilty). I’ve found that, while it makes me feel bad and does create waste, that tossing some things (and lightly chastising myself) helps me to make better decisions about what and how much to preserve in the future — being more realistic about what makes sense to keep on hand for my small household of two. In my book, it’s ok if you resolve to do better next time! I agree with you Alex. With just two people I try to watch more closely what I buy, especially if it has to go into the freezer. I try to have periods where I refrain from buying many groceries and try to be creative with what I already have. Being blessed with so much in this country many people think nothing of throwing away food. While I do end up having to discard food at times, it really pains me!! Bravo!! I have the exact same freezer space that you do (although my chest freezer is in my creepy basement, not the living room!!) It’s great to clean out sometimes but honestly – often all we have time to do is bag up those bits and pieces and stuff them in. – hence the baguette ends. I find the only way to address this is to keep a list on the fridge – I can’t remember everything i cram in there but I can write it down. 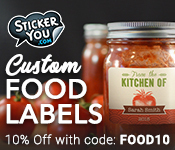 My custom list is sorted by meats, veggies, fruits, baking, meals, other. I keep a separate list on my fridge for the basement freezer. I find this super helpful for shopping lists (how much flour do I really have?!) and for meal inspiration – If you knew you had those baguettes maybe you would have made another apple crumble?! My small apartment (3 rooms) has a tiny fridge and freezer. We have a common room in the bldg. and I mentioned to the manager how nice it would be to have a freezer. She replied that she was not going to purchase one so I said that I would be glad to do so. So now must look into that. I miss having a freezer since down sizing. Everyone in my bldg. is over 60, (most are in their 80’s) and no longer cook so I do spread my cooking around. 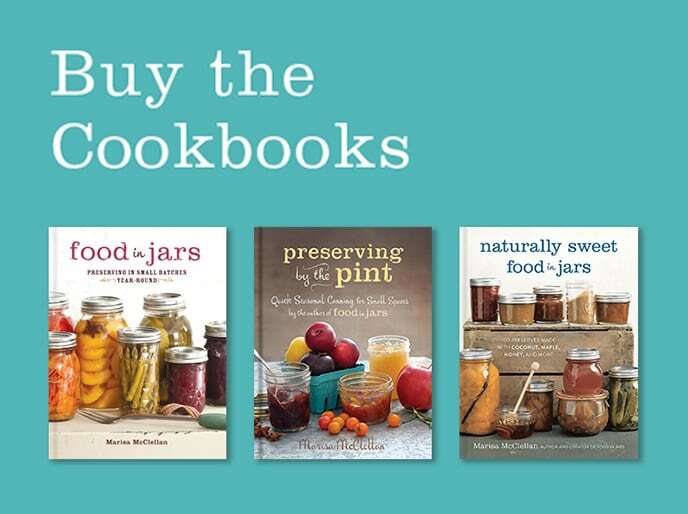 They love the food in jars recipes I make! Thank you for giving me the impetus to get busy. Having cleaned out the kitchen freezer recently and feeling good about it, every time I pass the freezer in the garage I know I need to clean it out too. I do start an inventory sheet every year as mentioned above, but somewhere along the way I become less diligent in adding and deleting items to it. Since I just have the bottom drawer freezer and the top freezer both in fridges, I don’t have to worry about large amounts of frozen things being left out for a long period. 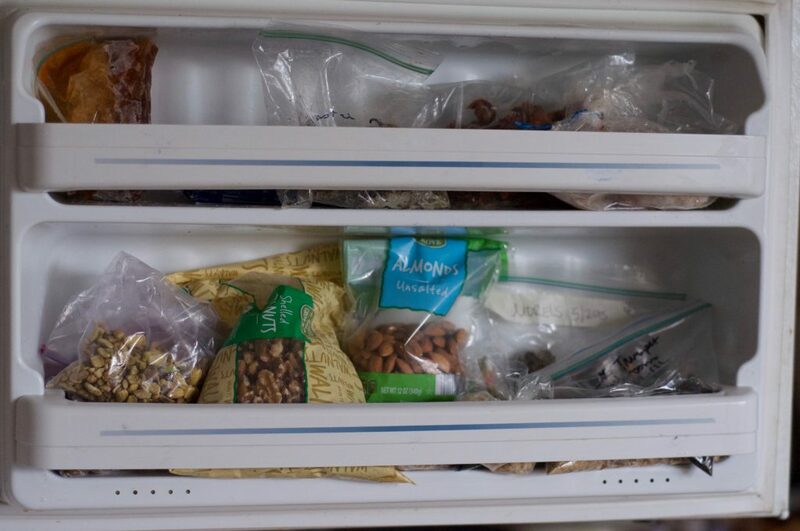 I pared down to just these two freezers several years ago when the family became just my husband and myself, and we started eating less meat and more fresh fruits and veggies. But that was also before I retired and started veggie beds in the back yard!! Yes, I use a lot of the freezer space for all sorts of tomatoes too and both my little freezers are packed until things start getting used up. So this year I plan to use my sister’s unused freezer space for some of the tomatoes and maybe I can stay better organized. You inventory list-makers and spreadsheet trackers are all way ahead of me! Personally, while I love making to-do lists for a given day (and find that it helps my productivity), I’m terrible at keeping these kinds of records updated over time. I only have a refrigerator freezer. In it, I have a small plastic basket that holds small bags, like pesto frozen in cubes, small amounts of leftovers, bacon that I have divided up, etc. which makes things easier to find. I can pull out the entire basket, if needed, and this also prevents those smaller items from getting lost in the back of the freezer. We have the refrigerator-freezer in the kitchen and an upright deep freeze in the basement. I use the kitchen freezer for day-to-day items and the basement freezer for advance meal prep (browned sausage, chicken cut up for stir fry) and “put-up” foods. I store most items in flat-frozen quart ziplock bags, which have the tendency to slide off each other when stacked – and if they hit the floor, break! I got some wire bins from the Container Store that are just the right size for a quart bag and now I’m using these in both freezers to keep things organized – so downstairs I have a bin for meats, a bin for fruit sauces, a bin for frozen stir fry, etc. etc. And in the kitchen I have a bin for frozen veggies, a bin for kid lunchbox items, a bin for treats, and so on. It means I can always see if we’re running low on a category (or need to eat more of something to use it up) and I’m much less prone to losing things! Reading this blog has inspired me to try to create an inventory of my deep freeze so I don’t have to throw out old stuff that’s no good anymore. Not sure I’ll get as far as a spreadsheet. I have a pretty large bottom drawer freezer with my refrigerator in the kitchen and an upright deep freeze in my laundry room. When we built our house, we had an outlet installed to support the freezer in the spot where the utility sink would have gone. I had to decide: utility sink vs freezer in the house (no basement here) and the freezer won out. The freezer in kitchen has a pull out drawer on top and 2 compartments in bottom. The top holds my spices/herb jars on one side and small jars of other items on other side. The bottom holds anything used to make a smoothie and breakfast bread items. 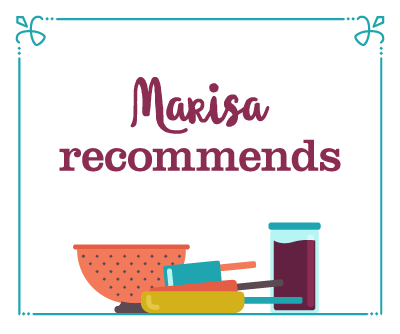 I use the deep freeze for leftovers, frozen fruit extras, frozen veggies, homemade sauces, extra baked goods, jars and bags of bulk purchased grains, flours, nuts, etc. I do reserve one shelf near the top for the containers of leftovers and small containers of frozen homemade applesauce and home frozen peaches so it’s easy for my husband to find something to take for lunches. I always package up leftovers in 1 serving containers. I saw a Talenti container in one of your pictures Alex and we love it too, plus the empties make great containers for leftovers. My husband just made about 7 quarts of homemade spaghetti sauce and I have it in the freezer too, mostly in square pint freezer containers so they stack on top of each other. Many yummy meals to come from that. Thanks for the motivation. I plan to reorganize mine this weekend. I have a side by side and a garage overflow top freezer. I too have bags of greens from summer with intention of making veggie stock and lots of bread and rolls. I even froze watermelon to make watermelon margaritas. Right now, I don’t feel like anything frosty with the subfreezing temperatures. I think they may have to be sacrificed. I will never get a french door fridge because it would become a bottomless pit. I’m not good at keeping up with frozen foods. Oh man. Watermelon margs sound like they’d be amazing any time of year! i feel your pain. Just after Xmas i did the same except i was a little more brutal! the chest freezer was emptied and most went into the freezer in the fridge (its draws are stuffed) and i now know what i have in it. I made a list. I also made a list for the chest freezer which i defrosted. I have since started to slowly restock this. Everything in the kitchen freezer MUST go. I have a use it or loose it mentality some times. I have made my way through almost everything in the little freezer bar the regularly used things. 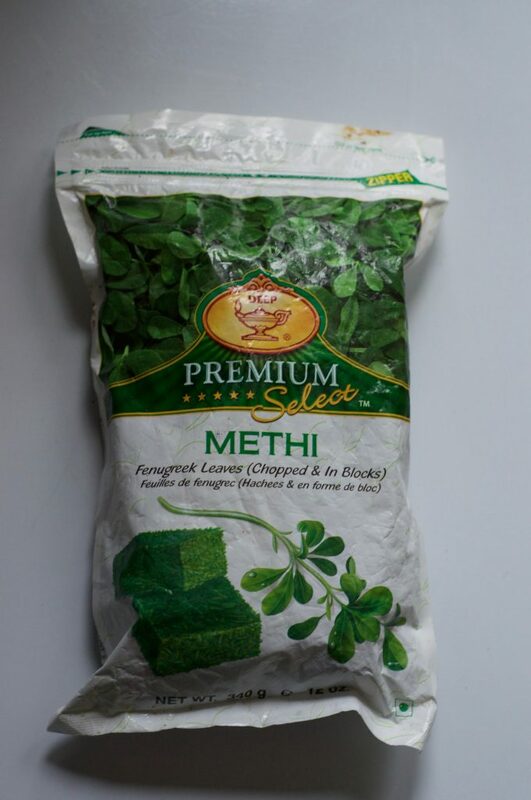 Now I know to avoid freezing green soup! I have 3 freezers (top of fridge, and two chest freezers) and I have a couple methods of trying to keep them sorted. I keep flour and nuts and other bulk supplies in one chest freezer, and meat, cheese, and vegetables/fruit in the other. In my fridge freezer are the things I use daily or need to see often. 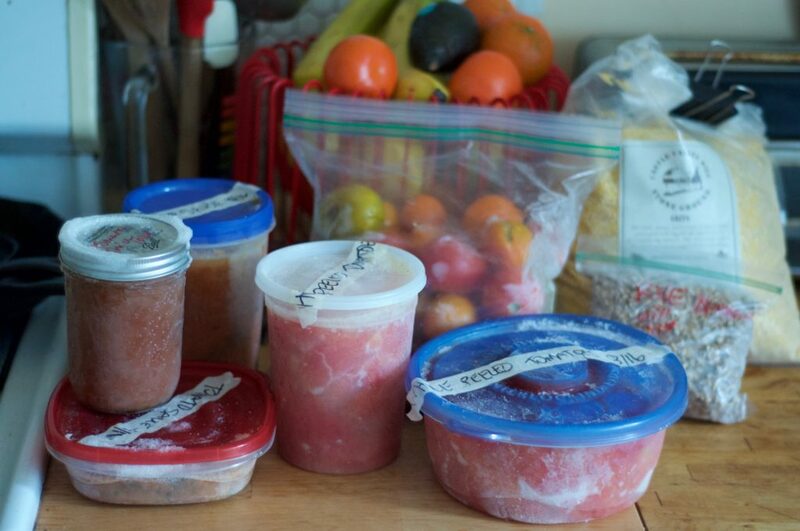 When I preserve food in the summer by freezing it, I keep a list of it in my canning/freezing inventory notebook. I don’t check it off as I use it up, but still, I have a better idea of how much is in the freezer and then it helps with future preserving plans. I also organize my chest freezers with milk crates (to allow air circulation) and a mesh basket that came with the freezer. This helps me to see inventory and also find things more quickly – the less time the lid of the freezer is open, the less frost builds up. I used to have a sliding pile of bags and frozen slabs of tomato sauce, chili, stock, amd who knows what, so i bought one of those wire organizers made to maximize space in a cupboard, the ones that fit into a corner, for my freezer. I have a plastic bin (surprised it hasnt cracked yet) where i keep all the “soup parts” like stock and vegetable scraps, separate from ready to eat stuff. I think I remember seeing a similar tip in an old issue of Cook’s Illustrated (all the weird tricks are my fave part of the magazine). Freeze soups flat, then stand them up in a magazine organizer! Great idea. Flat freezing is the way to go! Takes less time to reheat them, too. One tip i read said to lay your bags on a cookie sheet to keep them even, but i dont have room in my freezer for a cookie sheet most of the time. A flattened out cereal box works just as well. I have a medium-sized chest freezer which I defrost once a year in the summer, just before all of my fresh produce from the garden comes on, and after I’ve cleaned most of it out through the year. I put all the remaining food in coolers and I find if I put a large electric fan in the freezer, running on high speed, it hardly takes any time at all for it to defrost. I use a plastic dust pan to scrape the sides and clear out all the ice from the bottom, wipe it down and I’m good to go in less than an hour. – reusable grocery bags hold one type of meat each. One for pork, poultry, beef, seafood, and eggs. – with the reusable bags I can easily maneuver large quantities of food around to get at what I need. I do occasionally inventory the freezer just to get some ideas on what needs to be used up and get some inspiration on what to cook. Hope someone will find this helpful! Very interesting read. I have a chest freezer that (thankfully) defrosts itself and a side by side so defrosting isn’t a problem. I have used and loved them for years but in the past year have become like a wild woman keeping them stocked and in much better shape. I have tried a magnetized white board listing things, and attempted a spreadsheet but they both don’t work for me. I can fill them in but keeping them up to date isn’t working for me – but maybe ai should be more aggressive with myself. What really helps me is to make sure that everything is clearly labelled and kept in zones. 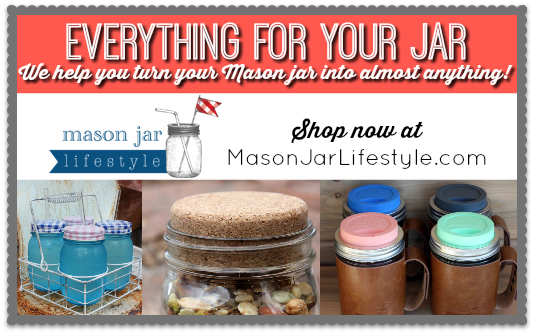 I hate using plastic bags for freezing so I have amassed a decent supply of Pyrex 501s over the years, and have just recently added a really large supply of large mouth mason jars (the smaller kind -not the huge ones) that I scooped up at Goodwill. I use white electrical tape to mark on each what the contents are and the date. I then group similar things together in zones and I just have to peek to see whats there. I do find that if life is chaotic opening the freezer is incredibly calming for me – freezer zen. Thanks for the post. Lordy, someone come save me!